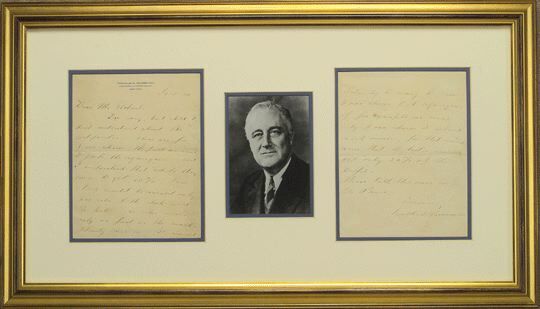 Autograph Letter Signed, two pages, quarto, Hyde Park, New York, September 14, no year. On his name-imprinted stationery, to Dear Mr. Roberts. “I’m sorry, but still I don’t understand about the certificates. These are for 6,000 shares, the full amount to go to the organizers-and I understand that while they were to get 10%, their stock would be issued only pro rata to the stock sold the public-in other words only as fast as the marks actually come in. It would certainly be wrong to issue 6,000 shares to the organizers if for example we issue only 6,000 to actual mark owners, for that would mean that the latter would get only 50% of the profits. Please talk this over with Mr. Paine. 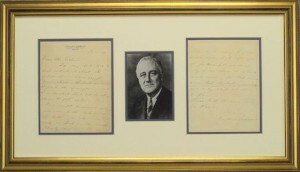 Matted in cream and medium blue with a formal portrait of Franklin D Roosevelt. In an antiqued black and gilt frame measuring 28 1/4 inches wide by 16 1/4 inches high.